Work On The Wild Side. Inspired by the world around him, designer Michael Madjus has always been a bit adventurous when it comes to his craft. With a background in fashion, art, photography, and music, Michael is happy to take a walk on the wild side to find his inspiration. Like observations from a jungle safari, his outrageous animal vases are just the thing to make spaces look a little less tame. 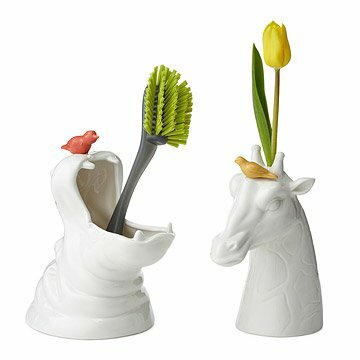 These expressive beasts are bound to fill your home or office with whimsy whether you prop them with fresh flowers, stow snacks, or round up your pen collection. Designed by Michael Revil Madjus in Toronto. Made in China. Flora Lam Inquisitive and curious by nature, Flora uses her work as an excuse to ask questions, experiment, and implement ideas. When not designing, Flora spends time with her canine offspring and tending to her vegetable garden. Michael Madjus Inspired by the world around him, Michael has always felt the need to stick his hands in as many different creative pots as possible. With a background in fashion, art, photography, music, and most recently a graduate from the OCAD ID program, Michael feels his designs are influenced by everything that he has known and experienced. If there's anything that Michael tries to adapt to both his life and work is that life is short, so have fun, make mistakes and just live already. I collect hippos and am always on the lookout for more, particularly if they have a function and aren't just figurines or stuffed toys. This vase made a perfect holder for my collection of Mardi Gras beads, allowing me to drape loops over the beast's jaws. This hippo is flawlessly made and of great quality! My mother absolutely loves it! Michael Revil Madjus' expressive beasts are bound to fill your home or office with whimsy.